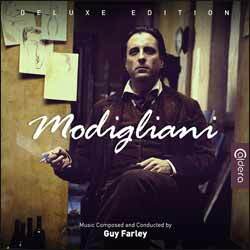 Guy Farley's score for Modigliani was originally released around ten years ago on Milan Records. It sold out fairly quickly and in recent years has commanded high prices when ever a copy comes up for sale on online auction sites. The main theme from the movie is a favourite of many soundtrack fans and probably Farley's most beloved composition to date. Farley has composed some incredible scores in recent years (The Hot Potato; Knife Edge; Mary of Nazareth) and I was interested to hear what one of his earlier works had to offer. Modigliani is a wonderfully rich score with so many themes hidden away that this is one album that rewards those that listen to it over and over again. For this new, deluxe, release Caldera Records offer a different presentation when compared with the original Milan CD (which contained 19 tracks - 47 min, 36 sec). It also offers a number of special bonuses tracks, the most notable of which is an interesting audio commentary by Farley (13 min, 47 sec) in which he details his involvement with the movie and how he came to compose the score. The album contains 32 tracks (1 hr, 15 min, 47 sec) and features a detailed booklet-text by Gergely Hubai and artwork by Luis Miguel Rojas. The CD was produced by Stephan Eicke and John Elborg. Musicians can also download a copy of the arrangement of the main theme for violin and piano thanks to a link contained in the booklet. It's a beautiful and intricate score that straddles the line between soundtrack and classical music. If you've been unable to add this to your collection, now is the perfect opportunity and if you already own it there is so much added material on display here that you'd be a fool not to pick this edition up.